Ahmedabad: Seventeen-year-old Varshil Shah, an Ahmedabad resident, scored 99.99% in the class 12th examination in Gujarat. 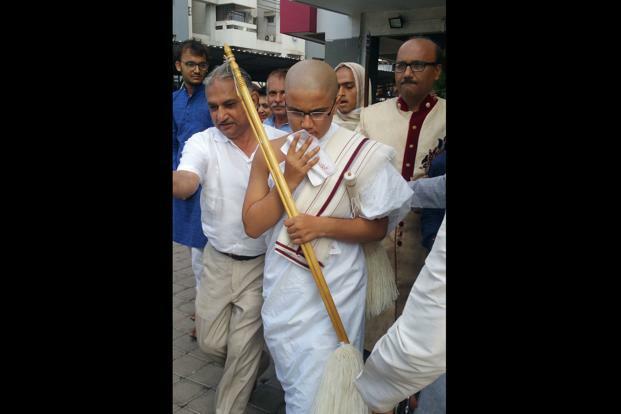 Now he is set to become a Jain monk. My goal is to attain inner peace and eternal happiness. That will be possible only when I leave behind everything and become a Jain monk,” Varshil said, speaking to reporters here. His family is supporting his decision, said Varshil, who will receive Rs.diksha’ (initiation) of monk-hood at a grand ceremony in Surat tomorrow. “Since childhood I used to think a lot about real happiness. Then I met my guru Kalyan Ratna Vijayji Maharaj, who made me understand fine nuances of Jainism and other aspects of leading a happy and meaningful life,” he said. “There is no end to the human greed. Those who are having thousands of rupees try to earn lakhs and then want crores. There is no end to it. But Jain monks who do not have anything except inner peace and knowledge are happier than these people,” he said.